In part one of this two-part series, we explored the many challenges caregivers face in the operating room (OR) and how traditional OR medication and narcotics management systems are often adding to the burden by impeding workflow. This article explores how advances in RFID (radio frequency identification) solutions can now address many of the challenges hospital pharmacists and caregivers face in the OR, and help modern hospitals increase safety, simplify OR work processes, reduce caregiver burdens and better manage drug inventories. Let’s explore how RFID addresses these challenges. A wireless technology, RFID uses electromagnetic fields (similar to radio waves) to read and capture information stored on a tag attached to an item, such as a drug vial. Unlike barcodes and other manual systems, RFID tags do not require people to individually scan or account for items. Many RFID systems are not designed to support the unique challenges of managing pharmaceutical inventory, particularly in an OR environment, where small vials must be affixed with even smaller RFID tags, and are then jammed in small drawers. Managing drug inventory in this type of environment is extremely challenging. The innovative new Intelliguard® Linked Visibility Inventory System™ (LVIS™) is a first, using patented and exclusive RFID technology to consistently and reliably identify large numbers of RFID tagged narcotics and medication items inside small open-matrix drawers. The revolutionary new Intelliguard® Linked Visibility Inventory System™ (LVIS™) empowers care teams in the OR to focus on what they do best by eliminating the need for manual intervention and providing true, real-time automation. Anesthesia staff simply open a drawer, take what they need and close the drawer. The system automatically tracks inventory and updates data in the Client Intelligence Portal, available in the pharmacy. The RFID-enabled LVIS™ automatically collects drug inventory data at the point-of-care, without requiring manual counting, paper recording, or item-level scanning, reducing the risk for human error or work-arounds. Anesthesia care teams simply open a drawer and take what they need without stopping to scan individual items, or performing time-consuming medication requests from drawers that only allow one medication dose per transaction. In fact, the LVIS Station™ in the OR does not even have a bulky monitor. The magic is all inside the simple, space-saving enclosure, eliminating distractions in the OR. Real-time inventory data is automatically relayed to the Client Intelligence Portal in the pharmacy. Using RFID enables the pharmacy to view and track actual, real-time, and accurate medication usage and inventory availability. This means low stock and pending expirations are identified immediately and replenishment is done quickly, giving anesthesia care staff the confidence that they’ll always have the inventory they need and eliminating the impulse to “hoard” medications in fear of a stock-out. Because no manual intervention for inventory usage is required, LVIS™ enables unprecedented billing accuracy. The system keeps a time-stamped record of all drugs taken, replaced and used, so getting an accurate charge capture is as simple as reconciling usage records with OR patient records. In addition, an accurate record of medications used by caregiver reduces the risk for, and cost associated with, diversion. The precise real-time and historical usage data provided by the Intelliguard® LVIS™ allows pharmacists to better understand specific medication and inventory needs by type of procedure, and even by caregiver. This historical utilization data coupled with real-time inventory visibility, leads to more accurate forecasting, better inventory optimization and a reduction in inventory holding and expiry costs. 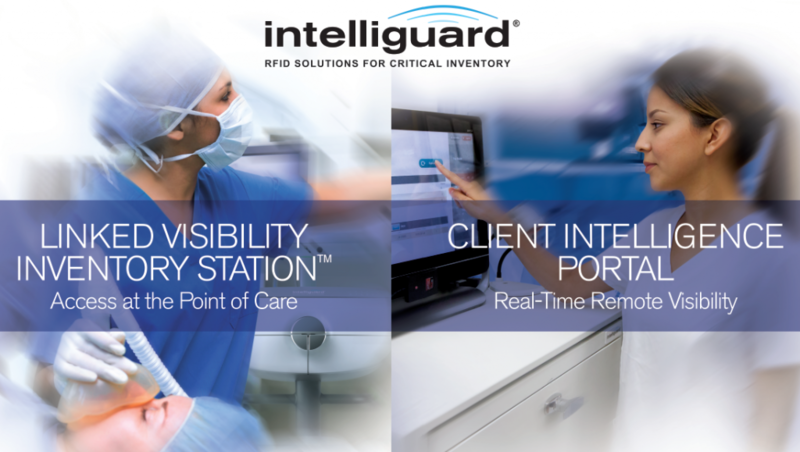 The Intelliguard® Linked Visibility Inventory System™ (LVIS™) is the first anesthesia medication and narcotics inventory solution that combines secure medication storage and access with radio-frequency identification (RFID)-enabled automated data collection. An LVIS Station™ in each OR provides RFID-equipped drawers to securely store medications and narcotics. Inventory automatically updates in real time each time a drawer is closed – with no manual input. View this short video to see LVIS™ in action or request a live demo for your hospital today.